Processions of purple-robed men traipse solemnly to the beat of funereal marches through smoke-filled air. Together, at least 80 of them carry a hefty wooden float, bearing a life-sized statue of Christ on top. Out in front of them, elaborate handmade carpets, known as alfombras, line the processional route. Step by step, their footfalls crush the delicate artwork between uneven cobblestones. For many years, I’ve photographed different events around Easter celebrations, from Ash Wednesday through Lent, culminating in the extravagant Holy Week celebrations in Antigua. Each time I go out, camera in hand, my aim is to have fun while capturing images of the celebrations. Afterward, I select and edit my best photos, and add keywords, titles, and captions before uploading them to multiple online stock agencies. Stock agencies are huge online image libraries where publishers, designers, bloggers, or anyone else can search for and buy images that meet their specific needs. By adding my pictures to stock websites, I can earn a passive income year after year. 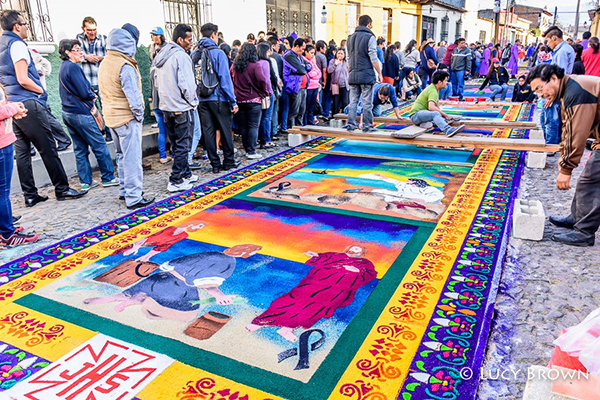 My favorite part of Holy Week is watching locals spend hours creating the beautiful procession carpets, transforming the streets into a grid of temporary works of art. Some are made of colorfully dyed sawdust using stencils to create intricate designs. Others are made of fresh scented pine needles decorated with fruits, vegetables, and flowers. Families, friends, and neighbors work together, creating their masterpieces, all to the backdrop of music spilling out from doorways. There’s a festive feel to the air. This year I’ll be photographing more laidback Holy Week celebrations in indigenous Maya villages around Lake Atitlán in the western highlands of Guatemala. Waterside communities cling to the hillsides or sit in the shadow of the majestic volcanoes dominating the shoreline. Water taxis ferry passengers between lakeside villages, while fishermen paddle tiny traditional watercraft. The views are stunning, constantly changing with the weather and time of day. Everywhere you turn is a photographer’s dream. 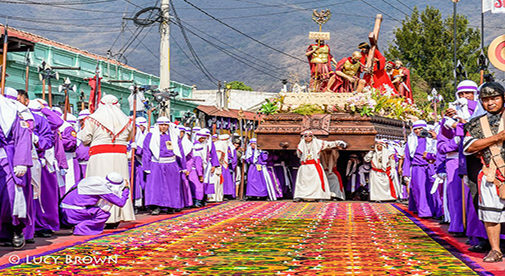 Holy Week at Lake Atitlán is a blend of Catholic and Maya traditions. Rows of dangling fruit adorn processional routes, carpet designs include Maya figures and deities, and indigenous folk clad in the traditional hand-woven dress of their ancestors add their own unique color to the festivities. I’ll be staying in Santiago Atitlán, the largest of the lakeside communities, inhabited by Tz’utujil Maya people who have their own unique customs. Here, they not only celebrate the resurrection of Jesus but also the rebirth of a Maya deity, Maximón, whom they hang by the neck first. Needless to say, this will be a whole new experience. My Lent and Holy Week photos are popular sellers year-round, so I’m eager to photograph some new Holy Week traditions that I can submit to my stock portfolios. I’m confident they will keep earning for me in the future and I can continue watching my passive income rise while I’m out photographing other adventures.